The late President Ferdinand Marcos can’t steal too much wealth from the Philippines that it doesn’t have. Different theories resurface but there seems to be a cover-up about its origin. However, the biggest struggle in the country is for his enemies to prevent his son, Bongbong Marcos to return to power. It’s about time for Filipinos to know what lies behind the black media propaganda against the Marcoses. 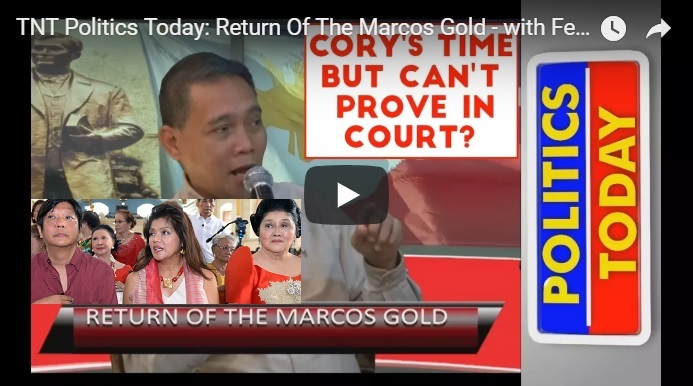 [VIDEO]: TNT Politics Today: Return Of The Marcos Gold – with Ferdie Pasion and Ado Paglinawan. No matter how the Liberal Party stalwarts accuse the Marcoses of hiding the alleged hidden wealth, the fact remains that despite the power held by the Aquinos and connivance with America, they can never nail down the Marcos heirs with legal cases. There’s never a conviction of crimes as far as the Marcoses are concerned. The money from the banks in Switzerland and Singapore that ended in the Philippine National bank was returned to the country because they are owned by the Republic of the Philippines. It’s only the alleged martial law victims who claimed that they are the payment for their plight during Marcos’ time. Former Senator Juan Ponce Enrile who was the defense minister and orchestrator of the martial law said that the national budget from 1965 to 1986 was only around 465 – 488 million Pesos. It’s less than half a trillion Pesos. If Marcos really stole from the country, then all the operational costs were not paid which was not the case. The late Marcos aimed to secure the economy. He was indeed right given that the “yellow” regimes are marred with vast corruption. His only request to the late President Cory Aquino was to allow him to return to die in the country. Nevertheless, Aquino was too scared that Marcos can get back public sympathy that can trigger public outrage. She rejected the 90% offer of all the possessions of Marcos because of pride. The current President must have the disposal of this wealth for the country. Legal cases are unnecessary. The welfare of the Filipino people should be the priority in projects like the Build Build Build. The opposition clearly does not have good intentions. They are more into preserving their lies to fake their glory. Regardless of their strategy, Bongbong Marcos continues to inspire his countrymen and urges them to gear up for a cause bigger than themselves.